Relyze - Interactive Software Analysis: Relyze 2.0 now with ARM support, Call Graphs and more!! 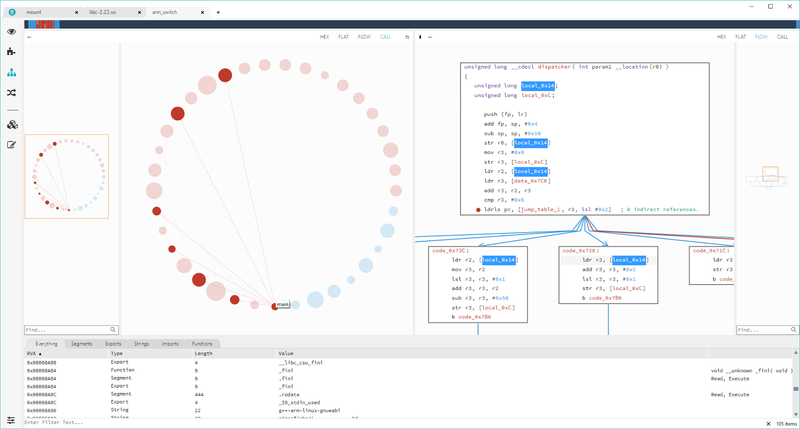 Relyze 2.0 now with ARM support, Call Graphs and more!! Today we are excited to release Relyze 2.0! The primary feature addition in this release is support for analyzing ARM (and Thumb) based ELF or PE binaries. We have also made several user interface changes for a greatly improved experience. For a full list of changes see the download page. We now support analyzing ARM based binaries and this includes Thumb and Thumb2 support. The analysis is on par with our x86 and x64 support and includes jump table analysis, function data type analysis, stack pointer analysis, static library analysis and binary diffing support. We support automatically detecting the processor mode for binaries that switch between ARM and Thumb but you can also specify an explicit mode if you need to. A small yet useful addition is the inclusion of a 'Perform Initial Analysis in Background' option when analyzing a binary in the GUI. This lets you drop straight to the UI so you can begin to explore a binary while the initial analysis runs in the background. Previously we blocked the UI until the initial analysis was complete but now you can start getting stuck in straight away. We have also greatly improved the performance of parallel analysis via the plugin framework for everybody with a Professional license. We have taken the opportunity to revamp the user interface, primarily with the removal of the large pivot menu which was used to navigate between the views. We now use a more compact left aligned viewer style menu. This reclaims quite a bit of screen real estate and looks good. We have also added menu items for the plugin editor and data type manager so you can quickly bring them up when you need them. We have completely rewritten the graph user interface subsystem from scratch and now have a DirectX based hardware accelerated graph subsystem that is buttery smooth for large graphs and has a slew of additional features on top of our existing graph feature set. This includes the ability to find nodes in a graph containing some text, which is great for poking around a large graph for some interesting information. We also added the ability to export any graph to either SVG or DOT formats so you can easily integrate with other graph tools or content. To take full advantage of this shiny new graph subsystem we have added a ton of features to the plugin framework for generating, manipulating and laying out custom graphs from withing the plugin framework. You can then either display these custom graphs in the GUI or export them as either SVG or DOT formats. We currently expose both a circular and hierarchical layout algorithm and will be adding more in the future. We didn't want to stop there so we have added a new viewer in the UI for quickly generating and displaying the call graph of an analysis so you can search for paths, find nodes and jump around an analysis via its call graph. Its a great addition and works best when you enable the split view (as shown in the screen shot above). Why not give Relyze a spin and download the latest trial! Existing users can use the builtin update feature to receive the latest version.